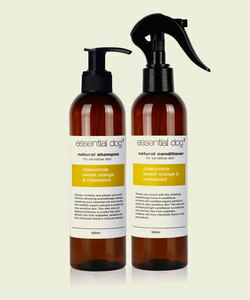 Established in 2012, Essential Dog is an 100% Australian Made and Owned brand passionate about providing safer and natural alternatives for your dog with our Premium Natural Dog Shampoos, Conditioners, Deodorisers & Natural Skin Remedies. After two years of intensive research we found the problem with the majority of grooming products on the market is the use of synthetic fragrances & sulphates which are highly irritating to a dogs skin and often cause skin problems such as dermatitis, allergies, itching, redness & irritated skin. Our products were carefully developed using veterinarians, naturopaths, chemists & natural perfumers and we have released a range of revolutionary dog grooming products like no other on the market. Unlike other natural dog grooming products on the market, we have formulated a natural shampoo that is thick & foamy without using sulphates and this is achieved by sourcing the highest quality ingredients commercially available without sparing any expense. Our artisan aromatherapy blends are carefully crafted by Australia’s leading natural pet perfumer and were designed for their aromatic properties to promote bath time as a pleasurable & relaxing experience for dogs & their owners. Our scents can be described as simply breathtaking. 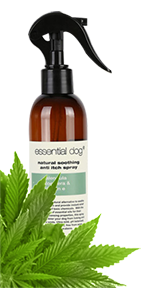 Our entire product line is formulated to alleviate dogs with sensitive skin or skin allergies and our pH balanced products are as mild as water & will not strip your dog of its natural oils. Our products are packaged in 100% recyclable & 100% biodegradable PET plastic bottles and all our dispensing systems (pumps, caps & sprayers) are made from 100% recyclable PET plastic. Essential oils are the most natural way to scent a product. Not only are they completely natural, they smell great and benefit both dog and owner to make bath time a pleasurable and relaxing experience. Our unique blend of oils provide a relaxed atmosphere during bath time and will give you a unique opportunity to bond with your pet. We source our therapeutic grade 100% pure essential oils from an internationally acclaimed Australian natural perfumery who specialise in pet products. Our supplier only sources oils of the highest quality and the purity and integrity of their oils are ascertained through gas chromatography and mass spectrometry. Please note our products are not designed for cats as essential oils can present problems for cats. To keep postage costs to a minimum customers we have a flat postage rate of $7.50 for up to 500g, $8.95 up to 3kg, $14.95 for over 3kg and free shipping for orders over $99. We use Fastway Couriers (with tracking) or you can choose Australia Post depending on your location. For courier services please specify during checkout if you wish to grant an Authority to Leave your parcel. Essential Dog cannot be responsible for lost parcels via an Authority to Leave. If you are not able to receive your parcel in person please request a re-delivery for when you are able to receive the parcel during business hours (available free of charge for one re-delivery only via courier only). Australia Post is used for international customers. For security purposes we only accept Paypal and Bank Deposit for all domestic internet orders. We only accept Paypal for International Orders. Payments are not processed through our website to ensure the highest levels of security. Upon checkout you will be directed to Paypal to complete your order. Paypal information is protected by SSL with an encryption key length of 168 bits (the highest level commercially available). ​ We do not share your personal information with any third parties. We believe in giving back to the community and support various animal rescue shelters and charities throughout Australia. For more information please visit HERE.